"This project would not have been feasible without Iron Speed Designer's built-in security model." 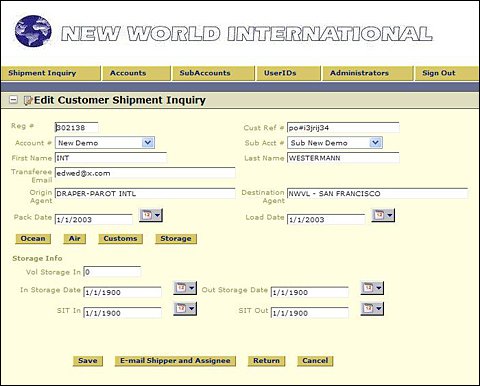 The International Shipment Tracking application was developed primarily for the U.S. Department of State (DOS). New World International, a subsidiary of New World Van Lines, works closely with DOS and commercial clients to relocate families around the globe. When a company relocates to another country, New World International steps in to help employees move their personal property from their current home to their new residence. Operationally, New World International utilizes specific secure processes and procedures to ensure successful global relocation. 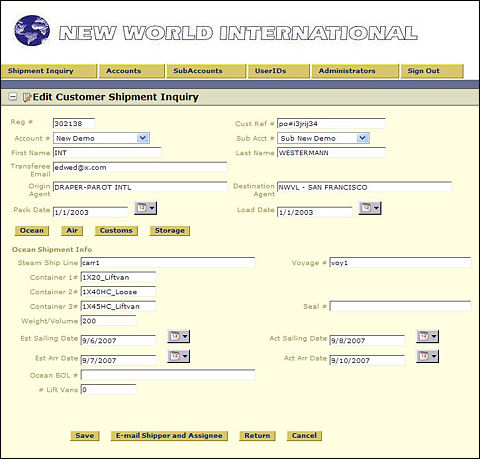 The International Shipment Tracking application provides real-time notification and status changes on international shipments. 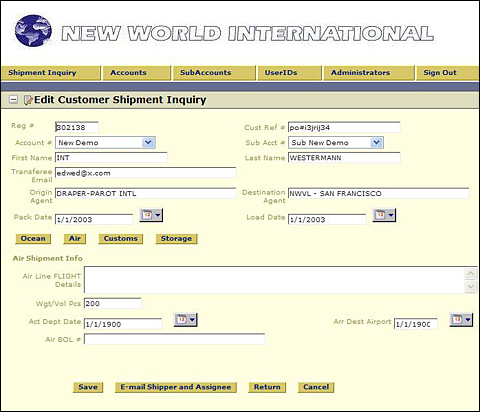 This new application is used internally by its transferees and international shipping customers. A user begins by creating a security entry for external access. The approved customer personnel managing the client side of the move can now access secure information. Secure access is also set up for the transferees so they can monitor the move. When changes are updated to our in-house business application, our database is updated and e-mail notifications are automatically sent to the relevant parties. 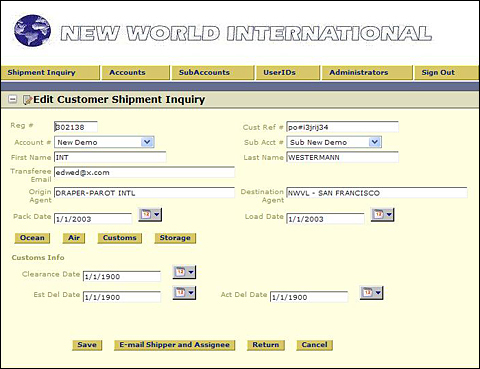 They can then access their personal shipment data via our secure web application. The application is comprised of seven tables and three views across one Microsoft SQL Server database. The largest of these is the Transferee Status Table, which holds 2,000 records. There are 20 Web pages within the application. Approximately 100 users access the database and process 2,000 to 3,000 transactions each month. The number of application users and transactions is expected to increase by several thousand over the next two years. John Lovrinic and I completed the project in four weeks using Iron Speed Designer. We spent a total of three hours building the initial application and approximately two days for generic formatting and the rest of the customizations. We wrote about 500 lines of custom code for this application. 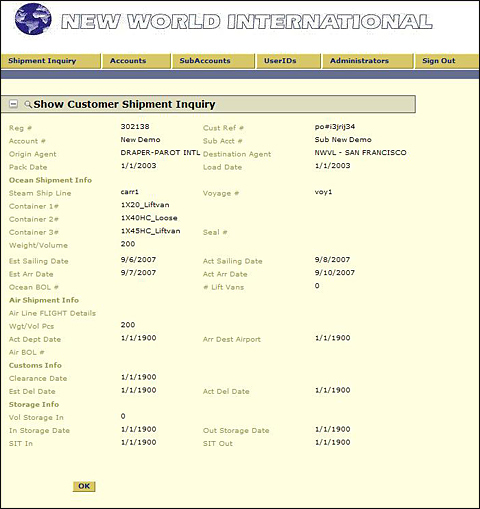 Automated e-mails notify both transferee and the managing party (Department of State or other NWI commercial customers) in real-time of changes in core and status records and allow them to check the status of the transferee report. Automated e-mail alerts are a specific DOS requirement, and the ability to incorporate this feature quickly and easily was another reason we purchased Iron Speed Designer. We spent about a week testing, debugging and optimizing the custom code. We incorporated tab panels to save even more time in the application. Users do not have to scroll through browser displays to review various report items. We used the standard McKinley design theme in Iron Speed Designer. We saved four months of development time using Iron Speed Designer and $40,000 in development costs. Without Iron Speed Designer, this project would have taken approximately six months. We really love having the ability to modify information at the database level and update the application in two clicks. This saves us a lot of time! This project would not have been feasible without Iron Speed Designer's built-in role-based security feature. During our evaluation of Iron Speed Designer, we determined the applications created in Iron Speed Designer are sufficiently secure out-of-the-box. The security feature in Iron Speed Designer was one of the deciding factors for our purchase of the tool. We continue to add application users, and the shipment application is expected to be used by United States embassy staff around the world. Further, we may expand its use to our other international customers. We are planning a complete rewrite of our in-house business applications using Iron Speed Designer, beginning in 2008. John Lovrinic holds a B.A. in Math from the University of Chicago. He has over 30 years' experience in application and database design and development. John has managed application design and integration teams for over 20 years. He believes that Iron Speed Designer is an excellent resource and can be used to teach new developers the proper way to design and build .NET web applications.